Fight The Fire! CRPS/RSD needs more awareness! CRPS/RSD is an awful disease that affects the entire nervous system. It's so underdiagnosed and usually takes years for a Doctor to make the diagnosis. It's a disease that causes so much pain and requires an entire lifestyle change. There is hope but not a cure. It requires a lifelong battle but you must keep fighting! I will keep up the fight..the disease will not win! I now have a great Doctor and in good hands. I have faith that this treatment will work! CRPS/RSD means a constant battle and you have to be ready for the fight! I will continue to fight this awful disease even though it is extremely difficult. I won't let it win! I'm an extremely stubborn and strong willed person and it takes a lot to knock me down! If I do get knocked down, I get back up! It's just who I am. It's not an easy battle at all and I get quite frustrated and upset at times. The pain is unbearable and I hate it..I truly hate it! I hate what is happening to me. I am still seeking treatment and hope that I can have some pain free days in the near future. The Doctor's are now looking at a possible diagnosis of MS on top of the TOS & RSD. My body has been through so much and my nervous system has suffered extreme amount of damage in a short amount of time. I will continue this life long battle! I'm 36 yrs old and mom to 3 wonderful and helpful teenagers! I have a wonderful husband who is so supportive. I was diagnosed with TOS (Thoracic Outlet Syndrome) in Jan 2007 and now recently diagnosed with CRPS/RSD. The TOS caused the RSD. I finally have the right team of Dr's in place but the RSD is progressing and very fast. 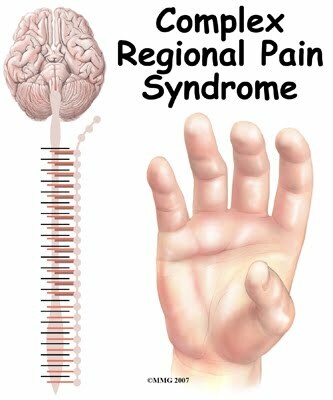 I have pain 24/7 along with so many other problems caused by the RSD. It's going to be a life long battle. It's not easy and it's hard to understand and absorb. I will keep fighting as I always have but I sure need all the support I can get. This is such an awful disease with no cure. I've had alot of my life taken away from me. This was all due to a work injury (repetitive strain injury). My life has changed but I will stay strong and hope that a cure will be found someday! I hope that others can understand and be supportive through this very tough time. I'd like to wish everyone a Very Merry Christmas! I can't believe it's that time of year already. I was putting up the tree 2 weeks ago thinking..didn't I just do this not that long ago! Here it's going to be 2010 very soon! WOW! Where do the days go! I now have been out of school 20 years..boy do I feel old! I haven't posted in a while because I have been pretty busy getting ready for the Holiday's and other family issues. I was also going through ketamine treatments and felt pretty good there for a while. The ketamine definitely works but this cold weather is NOT helping at all! My last ketamine infusion was December 3rd and my next one isn't until January 6th. I now go once a month for 2 days. I am back in a pretty bad flare up right now. My entire body hurts, horrible headache, red burning skin, hair falling out, vision problems, stomach issues, everything is back. I'm not to happy because I feel horrible. The weather got really cold here and has stayed cold for a while. We got a pretty good snow storm last weekend which was nice because it's now white for Christmas. That's all I've wanted for years now is a white Christmas. I wish it would snow on Christmas but that's asking for alot..lol. It's supposed to rain this year so the snow will be gone soon. A rainy Christmas is not what we asked for. I don't see this flare up ending anytime soon because the weather will still be cold, damp, cold,etc, etc. I am still on the list for inpatient ketamine treatment but have no idea when that will happen. In the meantime I'm toughing it out as I always do. I deal with it the best I can. I still can smile but somedays it's not so easy. I'm always tired and I don't sleep well. It's just a horrible disease and I wouldn't wish it on anyone. I plan on having a wonderful Christmas with the family. I'm sure the kids will be happy with what Santa brings this year. Maybe Santa will be good to me also :) I think I've been pretty good. Merry Christmas to all ..and a safe and Happy New Year! I will try to post more often to let you know how things are going. I am super cranky and in soooo much pain today. The weather here is COLD! It's too cold for October 12th! Our heat has been running already and this morning it was 37 degrees! At 1:00 pm it was still only 49 outside! How crazy is that? My right hand turned purple and felt like a block of ice. My shoulder and upper back (shoulder blade) is locked up in PAIN! My pain level is about a 20 on a scale of 1-10! I want to cry but I am staying tough! I am trying everything I can to get the pain level down. I am now wrapped in a blanket sitting here after wandering around the house in a blanket. My son thinks I'm crazy ..lol. Well...that's kinda..true lol! I just can't stand being cold and it's not just cold..it's damp! This isn't the worst of it either! It's going downhill this week! It's only going to get colder and RAIN! YUCK! San Diego HERE I COME! I'm getting more and more nervous about the ketamine treatment coming up. I'm still scheduled to start October 26th for the 10 day out patient. I sure hope it works or it's going to be one miserable winter! Either that..or moving to San Diego! I am super cranky, tired and in PAIN so I thought I would sit and post since it's been a while. The weather changed and keeps changing so I'm all screwed up. On a scale of 1-10..my pain level has been pretty much a constant 10 for days now. Everything hurts! I am soooo tired and feeling run down and out of it. The pain is getting to me. I can't move at times because it just hurts so bad. My right hand is so swollen that I can't even close it half way at the moment. I have been dropping things all day today. It's super windy here today and I absolutely hate wind! The wind is just BAD all around. I can't tolerate it when I'm like this. And of course it's a chilly wind. I had to go flor blood work today for the ketamine treatment. The minute the needle stuck me, my system wenr crazy. It hurt! My blood pressure has been high as well today so I'm trying to take it easy. I made pork bbq in the crock pot and it smells so good right now. I'm now getting hungry. It was a job shredding up the meat. It took me forever but I did it. I have to do things in steps. I do little bits at a time. I guess that sometimes gets me cranky and frustrated because I'm use to just doing doing doing...go go go..I can't do that anymore. I'm pooped out! Anyways that's all for now. It's going to be a chilly week..yippee! I just may pitch a tent somewhere in the desert!